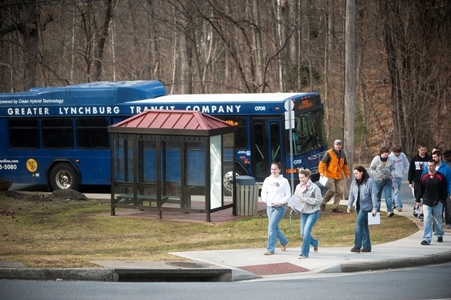 Students, faculty, and staff can ride the Greater Lynchburg Transit Co. (GLTC) buses throughout the city at no charge with a valid college ID again this year. This program, which began in the fall of 2010, is aimed at reducing the carbon footprint of the campus community as it continues its third Year of Sustainability. Last year, members of the LC community boarded GLTC buses more than 13,000 times. Dr. David Perault, associate professor of environmental science, has created a web page to demystify the bus schedule. GLTC will be at the Organization Fair in September. Bus schedules are available on line.